AudioBox iOne is a mobile interface in the best sense of the term. It can sit on a tabletop or fit in the pocket of a backpack or laptop bag and works with standard iOS power accessories. Its metal chassis is built like a small tank yet it weighs just 1.35 pounds (0.63 kg). Wherever your travels take you, whenever your creative muse calls, your AudioBox iOne interface will be ready to help you compose and record your masterpiece. 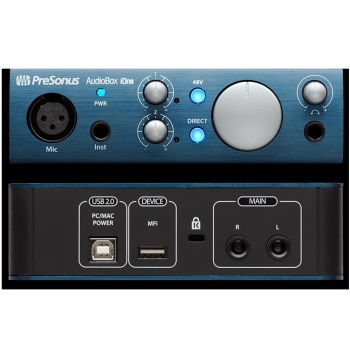 Check it out at your favorite PreSonus® dealer.